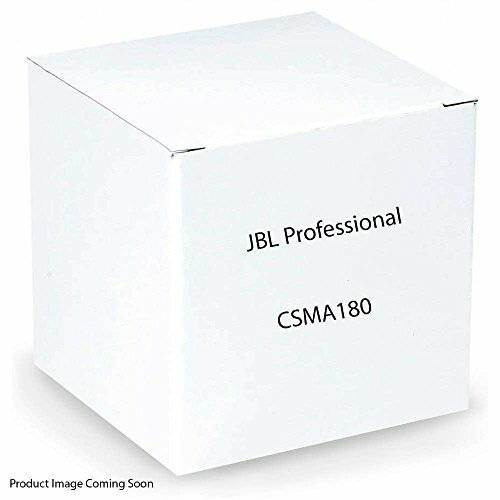 The JBL CSMA 180 is a 4 channel, 80 Watt powered mixer-amplifier. This mixer amp offers ease of use and a clean, front panel featuring volume controls and master volume adjustment, adjustable bass and a power switch. This is ideal for commercial and industrial use, new line of lightweight mixer-amps leverage Crown's high-efficiency DriveCore Technology and HARMANs GreenEdge environmentally-conscious manufacturing so they quickly pay for themselves in energy savings. With a sleek industrial look and a clean front panel featuring only volume controls for each channel, they offer you an easy-to-use professional tool with uncompromised performance. All volume controls on the CSMA 180 are surrounded by an illuminated ring, making them easy to see and operate in darkened environments. The amplifier can drive 8 ohm and 4 ohm loads and can be used with 70V and 100V distributed audio systems without the need for a separate transformer. In addition to balanced mic/line inputs, unbalanced RCA inputs and speaker connections, all units include RJ45 connectors for use with JBL CSR-V in-wall volume controls. This model feature a universal power supply which enables the ability to accept AC voltages from 100 to 240 VAC, 50/60Hz. If you have any questions about this product by JBL Commercial, contact us by completing and submitting the form below. If you are looking for a specif part number, please include it with your message.